The young man in the photo is the 11-yr-old son of Shawn Moore. The gun is a .22 rifle, a copy of the AR-15, but a 22 caliber. The photo was posted on Facebook by a proud father. That Facebook posting apparently triggered an anonymous call to New Jersey’s Department of Youth and Family Services (DYFS). On Friday night, March 15th, two representatives from the state’s social services office (along with four local police officers) came to the Moore home and demanded to see the family’s firearms. NRA Certified Firearms Instructor – One of the toughest certifications to attain, requiring skills with the weapons as well as teaching. Shawn’s son is also someone who has been certified by the state of New Jersey. In order for a person under the age of 18 to go hunting in New Jersey, they must be accompanied by a parent or adult supervisor, and they must also pass a state firearms hunter safety test. The young Mr. Moore passed the test and his father was NOT his instructor. TheBlaze first learned about this story via a tip from reader who spotted Shawn Moore’s post on a pro-Second Amendment website. ”ShawnMoore81″ is a member of Delaware Open Carry, an online community dedicated to supporting open-carry in the state of Delaware. His account of the above incident at his home might give any law-abiding gun owner chills. Last night I was out with a buddy of mine. I got a text from my wife that the cops and dyfs are at the house and they wanna check out my guns and needed me to open my safe. I’m instantly on my way. I get in contact with evan Nappen on the way. I explain the situation. I walk in my house and hand the phone to the first cop I see. Then direct all of em outside. 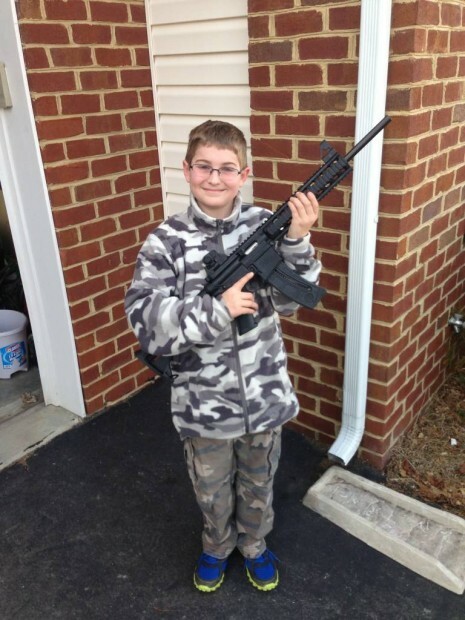 Dyfs got a call because of a pic on my son holding a gun. They wanted to look around and check all my guns out, make sure they were all registered. Obviously that didn’t go well because I refused. I had Nappen on speaker phone the entire time so they had to deal with both of us. They kept trying to pressure me to open my safe. They had no warrant, no charges, nothing. I didn’t budge. I was told I was being “unreasonable” and that I was acting suspicious because I wouldn’t open my safe. Told me they were gonna get a search warrant. Told em go ahead. Nappen (my lawyer) asked me for the dyfs workers name. she wouldnt give it. i asked for credentials and she wouldnt show em. i tried to take a pic of her and she turned around real fast and walked away. After a while of them threatening to take my kids, get warrants and intimidation they left. Empty handed and seeing nothing. People it can happen that fast. Most people wouldn’t have stood up to them like I did. Mr. Moore also took photographs of the incident. One shows four police officers (wearing bullet-proof vests) from the Carneys Point, NJ police department were on the scene Saturday night. TheBlaze contacted Chief Robert DiGregorio of the Carneys Point PD to get the department’s account of what happened. The chief did not answer or calls or return our messages. As you might imagine, the very tight community of Second Amendment supporters has posted this story on Facebook pages and various pro-gun websites. TheBlaze reached out to Mr. Moore in hopes of confirming all of the details he shared as well as asking why he thinks DYFS was called, and where the story stands now. Does the DYFS have a right to look inside Moore’s safe? Can they demand that he show his firearms to them? The agency and local law enforcement may be looking to see if Moore violated New Jersey’s Code of Criminal Justice, specifically, 2C:58-6.1 Possession of firearms by minors; exceptions. c. A person who violates this section shall be guilty of a crime of the fourth degree. For purposes of this section the fact that the act would not constitute a crime if committed by an adult shall not be deemed to prohibit or require waiver of family court jurisdiction pursuant to N.J.S.2C:4-11 or to preclude a finding of delinquency under the “New Jersey Code of Juvenile Justice,” P.L.1982, c.77 (C.2A:4A-20 et seq. ), P.L.1982, c.79 (C.2A:4A-60 et seq. ), P.L.1982, c.80 (C.2A:4A-76 et seq.) and P.L.1982, c.81 (C.2A:4A-70 et seq.). Calls to the Trenton office of DYFS (now known as “The Division of Child Protection and Permanency”) have not yet been returned. Reblogged this on NJ Gun Rights Blog.